Note the crank used to adjust the grill height and built in sideboards. Nice. Anne's three-layer sour cream cake. 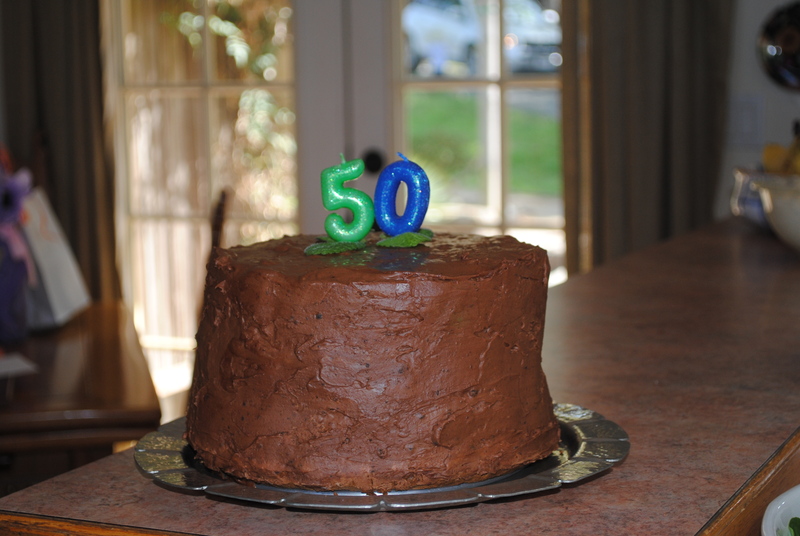 I spared the inferno of individual candles and went for the simplicity of 5-0. There are advantages to living on a ranch. One of them is the custom-built barbecue, hitched to the back of a pick-up truck. I can tow it up from the barn to our front yard and I have an instant way to feed a crowd. It really makes those fancy Viking grills look pretty wimpy. We use mesquite wood chips and pieces of firewood for authentic flavor, no charcoal or lighter fluid fumes here. We celebrated Joe’s 50th birthday this week and I recalled the rule we had when our children were young: one guest per year of celebration. (I can’t say I actually ever followed this rule, but it always seemed like a good idea.) One year olds: one friend, two year-olds: two friends, etc. etc. 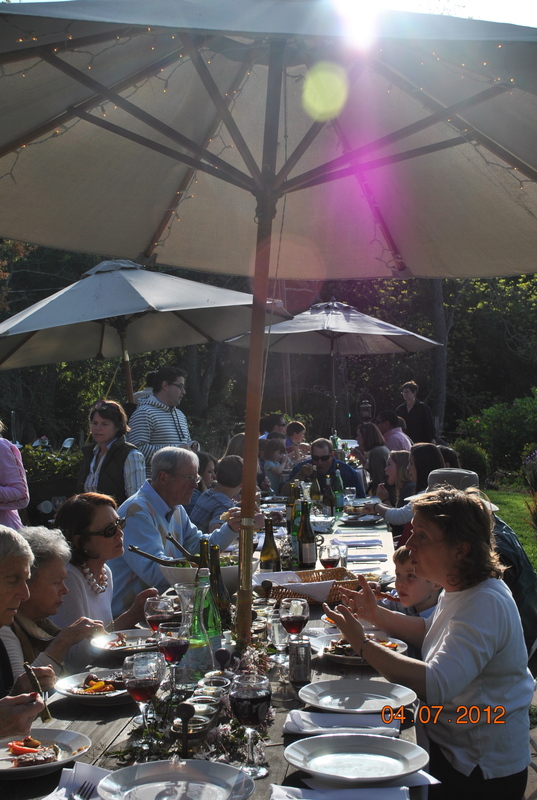 So, we had 50 guests and a lot of California asparagus to grill. We added orange, yellow and red bell peppers, all seasoned with lemon pepper and Orsi vineyards extra virgin olive oil. Yum. 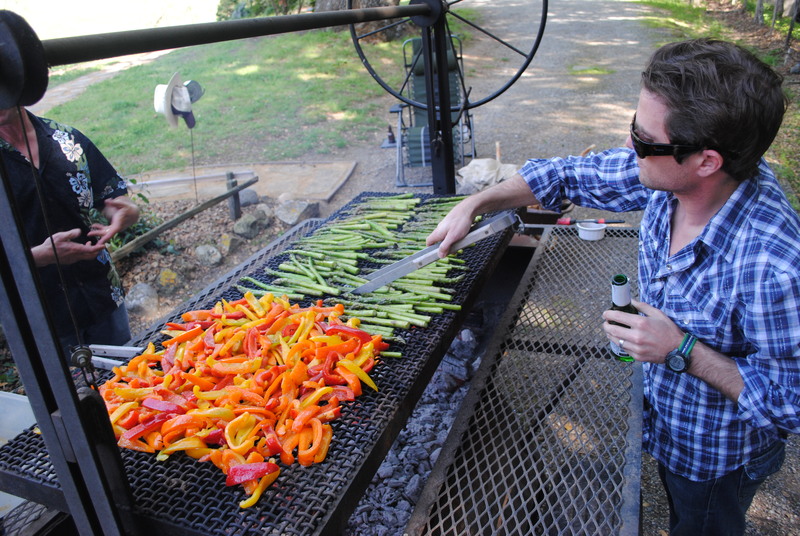 The veggies went on first, followed by 40 Morris Grassfed New York steaks, done to perfection (read: rare). Not to be outdone by the side dishes and main course, I enlisted Joe’s six sisters (that’s right: six) to each bring a cake. They reminded me that Aunt Thelma, affectionately known as “Aunt T,” used to always bring the cakes to their birthday parties and would bake anything they asked for. She is an amazing cook. So Aunt T brought her chocolate cake and Joe’s mom, Anne, brought an old favorite of his: a three layer sour cream chocolate cake. It was a bad day for a diet, but a good day to celebrate Joe … and the healthy and delicious food he is so dedicated to producing. 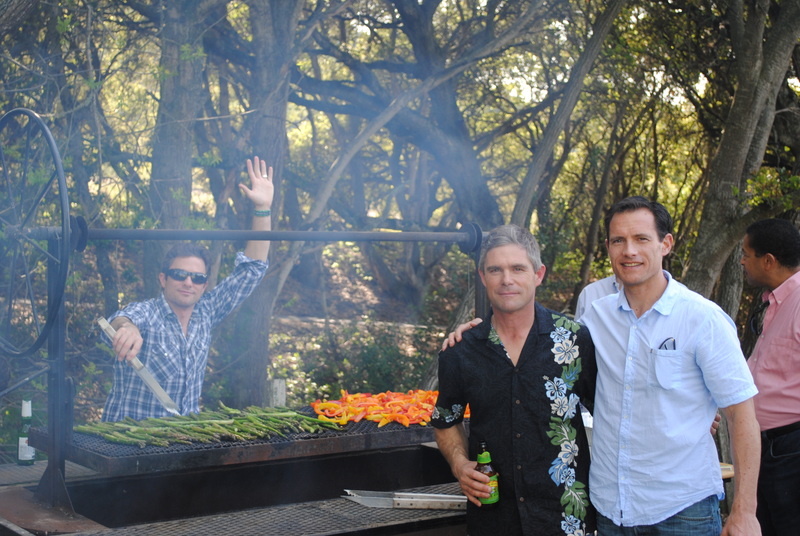 Richard (behind the grill), Joe, Jeff and Maurice hanging out by the grill. 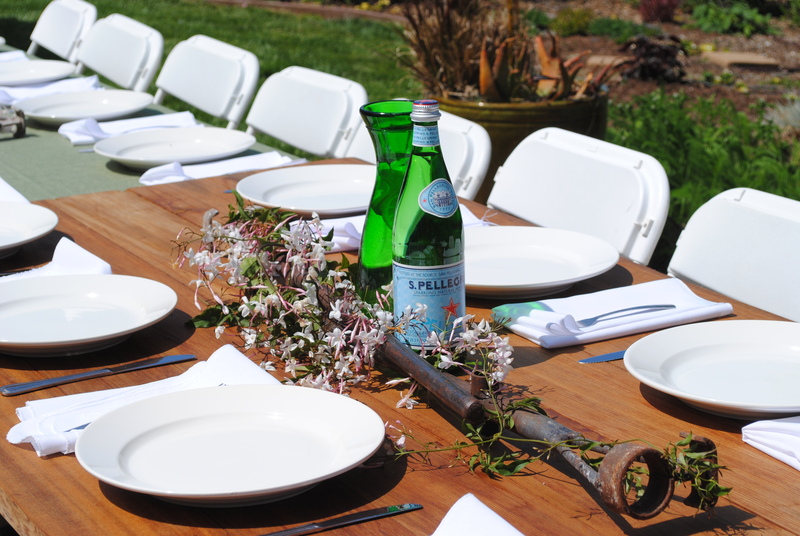 Branding irons and jasmine make great center pieces.